As a rudder comes with the yacht as a package one tends not to spend too much attention and time on the steering system including the rudder. Don’t take a well functioning rudder for granted and have a good look at it when the boat is hauled out. Drop the rudder enough to visually inspect the place where the stock sits in the lower bearing. Rudders are very heavy. 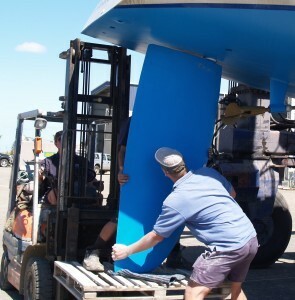 A fork lift truck is necessary.The lower bearing, particularly in case of a free hanging spade rudder, takes heavy loadings and needs to be inspected for wear and tear. Test the rudder when under sail and heeled over. Any visual signs of corrosion in this area should be addressed to prevent failure. Instruct a surveyor to have a good look at it when purchasing a yacht. Check in case of a wheel and cable steering system the sheaves that take the load of the cables between the wheel and the quadrant. Check quadrant and connections as well. The steering cables should be hand tight. No chafe or rust should be discernible. Have a spare steering cable made up just in case. Rudder failure may not happen regularly or sound life threatening but it will put a crew on a long distance passage under considerable strain. One should think ahead and have a solution for rudder failure such as drogues or a cassette rudder just as one has a life raft. Hopefully never to be used but for good peace of mind. Autopilot or wind vane do the job of two crew members without asking for a berth or food from the galley although autopilots consume quite a lot from the battery bank. They are not just popular, they are essential on a cruising yacht and most have a name. The famous Joshua Slocum sailed single-handed round the world from 1895 till 1898 in his yacht Spray without the help of a wind vane let alone an autopilot. His yacht was so well balanced under sail that it could sail for weeks on end without a hand on the helm. Development of wind vanes accelerated in the 1960’s in the early days of single-handed ocean racing. The famous Blondie Hasler developed for his 25 foot junk rigged Jester a servo pendulum vane with a vertically hinged wind vane the size of a small mizzen sail at the stern of his yacht. Nowadays many designs later we have wind blades that are almost horizontally hinged allowing smaller blades and more effective action when the wind over the blade changes in direction. Two different types are widely available for steering relative to the wind direction. 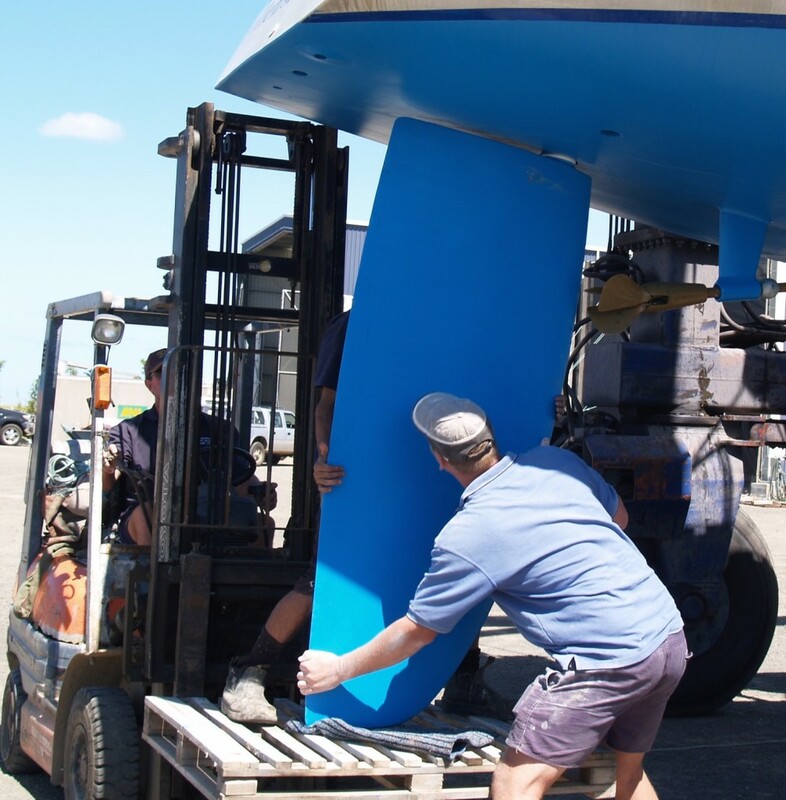 One type has an independent rudder with the claim that this rudder can act as a spare rudder although it is very small compared to the main rudder and therefore only suitable for smaller yachts. Hydrovane is an example. 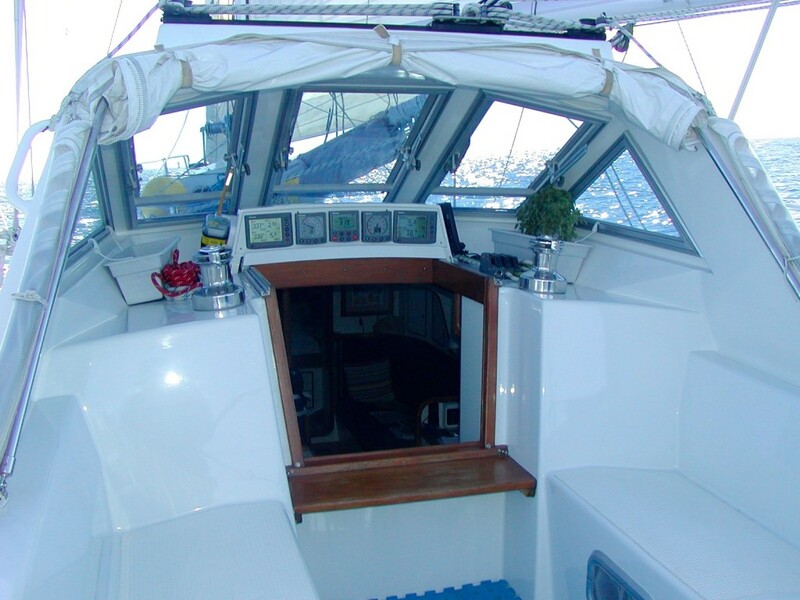 The majority of the smaller yachts, up to 50 feet are equipped with the popular and powerful servo pendulum system also with an upright almost horizontally hinged wind blade linked to a hinged pendulum behind the stern which is, with a system of lines, linked to the rudder or the wheel of the yacht. A change in wind direction over the upright wind blade pushes this blade sideways over which in turn angles the pendulum which then in the water current forcefully veers sideways pulling with a system of lines the rudder and thereby correcting the course and thus bringing the yacht back to the original apparent wind course. This pendulum set-up is so powerful that the pendulum can break itself or the frame in which it hinges by swinging too far out. Cruisers praise the quiet, reliable and undemanding performance and sport often a solution to utilize the vane when motoring in wind still conditions in the shape of a small electric tiller pilot to fit to the wind blade mimicking a wind direction as a compass course. A wind pilot typically steers the boat to the apparent wind. Particularly up wind they perform well but are not as good on a downwind course since the wind strength diminishes with the boat speed and the sail area is less well balanced. 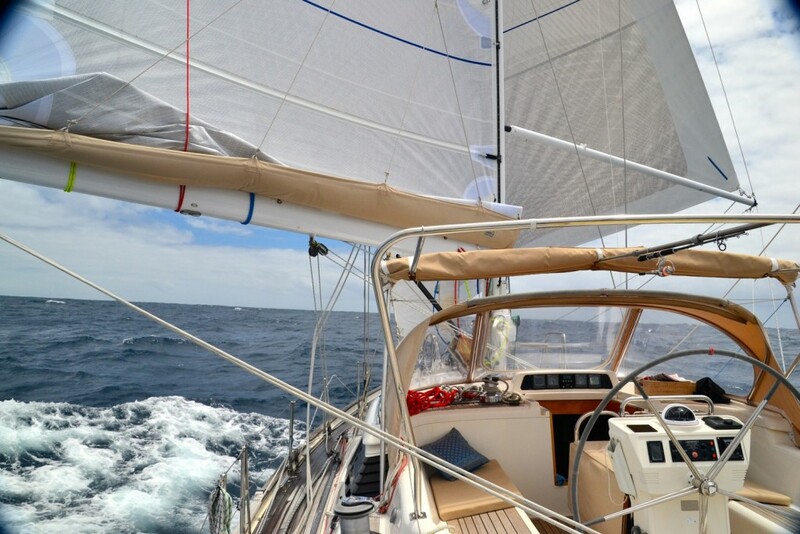 A potential risk for smaller faster yachts is that a sudden burst of speed downwind off a wave brings the apparent wind forward and the vane then causes the yacht to bear off resulting in a gybe. Not nice when you are cooking dinner down below. The pendulum in the water should be easily retrievable so as not to interfere with manoeuvring backwards in a marina. The pendulum should also always be secured with a safety line in case of breakage through flotsam. 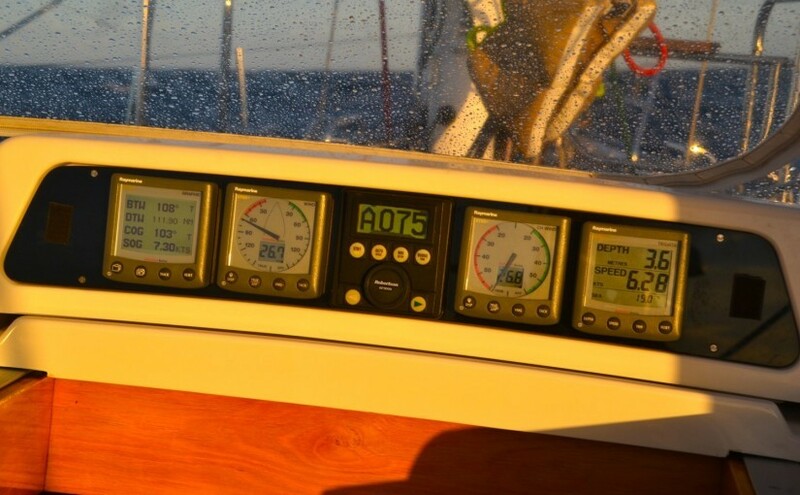 When choosing a windpilot make sure to choose one more than powerful enough for the boat. Autopilots for bigger yachts are mainly electric or electric/hydraulic and steer a set compass course. Pushing and pulling the quadrant on the rudder stock of the cable steering system. The connection between ram and quadrant needs to be very strong. Apart from noisier they are also hungrier capable of consuming more than 5-10 amps when at work. A reliable big enough battery bank and a capable charging system are essential. Most important for both systems is that the sails are set well balanced. Too much sail area and heel causes an autopilot to overwork itself with detrimental result. A wind pilot simply won’t work to begin with. A down wind well balanced rig perfect for the trades. 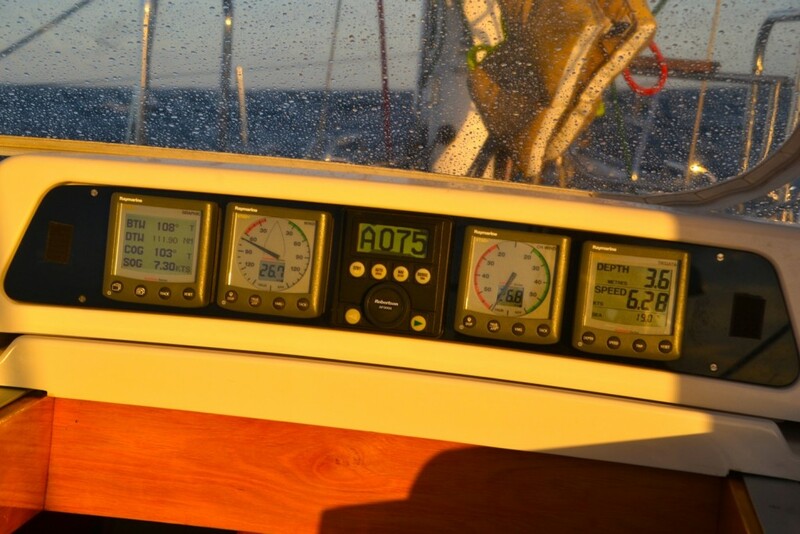 Nowadays even smaller yachts tend to be equipped with an autopilot even when they have a windpilot. Small yachts with a tiller could use an electric mechanical push pull device but in the long run this mechanical type doesn’t last. 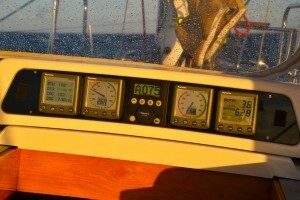 Autopilots for bigger yachts consist of one or more control panel(s), a computer, a heading sensor, a rudder drive and a rudder position sensor. Technological development has lead to reliable systems that once set up for a particular yacht also automatically adapt to the sea state through rudder and counter rudder action variation using gyros. A Fluxgate compass provides heading information but in some systems the heading sensor makes use of GPS signals. For long distance cruising with conventional cable steering a rudder drive should be electric/hydraulic where a powerful ram connected to the quadrant pulls and pushes the rudder. For bigger yachts a dual ram pushing and pulling at the same time is sometimes required. Make sure you can keep an eye on the hydraulic fluid level and that topping up is simple. Steering for the autopilot is nevertheless challenging downwind in following sea conditions. Some systems claim the capability to steer a wind course using the input of the anemometer. This would only work in a completely flat and calm sea because any movement in the top of the mast certainly in light airs with even the smallest of waves will give unreliable wind directional signals. A tack and gybe mode based on compass course is much more useful. The Robertson autopilot is controlled manually and set as close to the required bearing to the waypoint as possible. The instruments are located above the entrance into the saloon underneath the sprayhood.The depth reading is caused by disturbed water. Also the possibility to plug in more than one control unit makes good sense. One unit near the steering wheel to facilitate changing from stand by to automatic when steering and one unit in a protected location from where the crew can observe the surroundings and adjust the heading in relative comfort. A unit at the chart table only makes sense in a pilot house from where one can look out. A convenient and well protected location for the navigation displays and the autopilot control panel. Ideally an autopilot should be linked into the navigation system but be never attempted to hand over control to this system by clicking on a waypoint and expecting to arrive there without an accident. On a sailing yacht there is always the changing wind direction and subsequent sail handling to keep the crew alert but on a motor yacht that wouldn’t be the case. Many autopilots are available. choose the ones with world wide service points.